Size: 4.6″. 5 per pack. 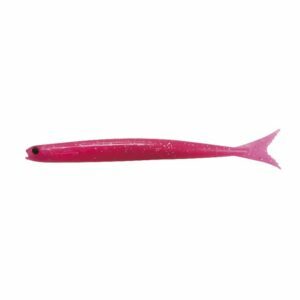 Infused with Nikko’s shrimp based scent, UV fluorescent bulging eyes, vertical tail and minute detail, the ikanago minnows are highly effective in both fresh and saltwater. Very effective for drum, sea trout, snook and tuna. In freshwater, both smallmouth and largemouth love this bait. This bait will outlast almost everything on the market. Super soft, stretchy plastic will provide great longevity through many catches. Biodegradable. Phthalate and toxin free. Stretch baits to “recharge” scent. Keep separate from other plastics.